An all around knee and elbow pad for thrashing asphalt! Featuring high-grade fabrics, knee cup interior foam and full coverage cups (replaceable with our Re-Caps) make these pads a killer value. Designed by riders for riders. Open back design for easy entry and soft, absorbent slow memory knee cup foam to give generous protection. Durable rubber material on the inside of each knee for seat pinching grip. 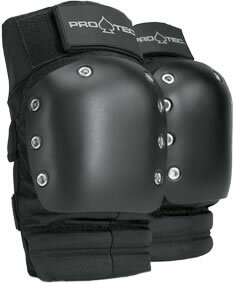 Pro-Tec shin guard compatible.